A trio of housekeeping staff noticed Barbara Bush standing in a hotel hallway with her son, Jeb, on a snowy February day in Concord, New Hampshire. Starstruck, the three women bashfully approached the former first lady, who was 90 at the time, as her son stood patiently by holding a stack of papers. "Have you met my son, Jeb?" Barbara Bush said, redirecting their attention to her second-eldest son while leaning on her walker, which was adorned with a "Jeb!" bumper sticker. The women politely acknowledged the presidential candidate and former two-term governor from Florida, then one handed him a phone and asked if he would take their picture with Barbara Bush. Happily, Jeb Bush started to take the photo before an aide took the phone out of his hands and snapped the photo. 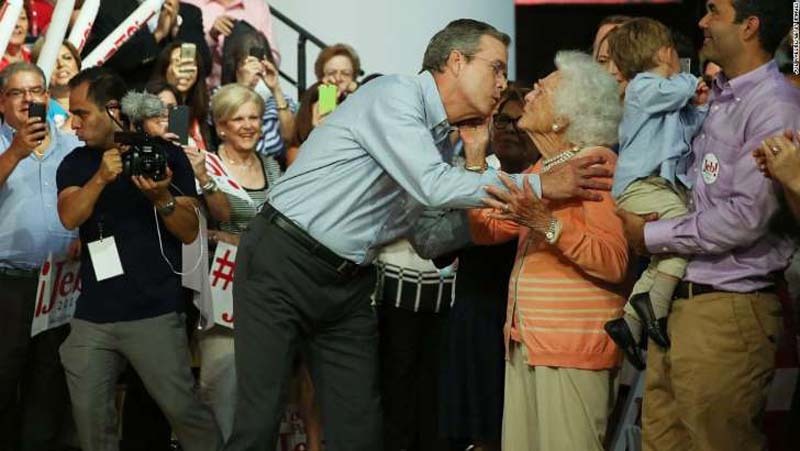 It was a moment that underscored not only Jeb Bush's admiration for his mother, but also the star power she brought to her son's campaign in what would become the final weeks of his presidential bid. On Saturday, roughly 26 months later, Jeb Bush said a final goodbye to his beloved mother and the matriarch of the Bush family. He delivered a eulogy at her funeral in Houston, describing her as a teacher, a role model, and a "looming presence" that guided him at all times. "By the way," he said, looking up from his prepared remarks as he started to choke up, "she was beautiful 'til the day she died." While Barbara Bush was the wife of a president and the mother of another, it was her relationship with Jeb Bush that drew the most recent sustained attention to the Bush family, as he ran a campaign that started out with an unprecedented amount of money and expectations but floundered amid the unexpected rise of Donald Trump. It was in Jeb Bush's remarks, interviews and other appearances, that the public got a trove of updates and colorful anecdotes about Barbara and George H.W. Bush, a series of comments that revealed Jeb Bush's esteem for his mother as not only an American icon, but his own moral conscience. "Is your mom as amazing as it seems?" "When I was born in Midland, Texas, my little eyes opened and there I was, probably crying and trying to get a little oxygen," Jeb Bush said on one of his first campaign trips to New Hampshire. "I looked up, and Barbara Bush was there. I didn't know it at the time, but I won the lottery." It was a line that Bush often used at campaign events, and it was a big crowd-pleaser. While Bush would briefly acknowledge his famous family during speeches — usually with that line — he also attempted to paint himself as his own man, one who loved his family but was not defined by them. Still, regardless of the distance he tried to keep, he was perpetually asked about his family on the trail. In Dover, New Hampshire, one man thanked Bush's family for their service, calling them "the closet thing to royalty we have," while another man told the candidate that a "third Bush" would be better than a "second Clinton." The following morning in Portsmouth, a woman had one question for Bush. In the final days of his campaign, the Bush team embraced the idea of heralding the family name. Former President George W. Bush appeared at a rally in South Carolina, but it was Barbara Bush who was first brought out -- roughly 10 days before -- in New Hampshire and then again for an encore in South Carolina, where she went to school. She also starred in an ad for her son. "I don't think she was prepared to endorse anybody else, but it's a nice validation," Jeb Bush quipped once while talking about the ad. Even when she wasn't on the trail for her son, she was still with him. Jeb Bush was once asked by a voter in New Hampshire, "What the hell are we going to do with this Trump idiot?" "I have a looming presence of Barbara Bush saying, 'Be careful here, Jeb,'" Bush said, as he began to answer the question. Another voter asked him at an event in Concord why he refused to use the same kind of negative rhetoric that Trump was using. "It's part Barbara Bush," he responded. "It's just not my nature. And you're not going to win the presidency by insulting." As he vented about campaign advisers who urged him to get rid of his glasses, Bush said he liked his glasses and would feel less authentic without them. "Barbara Bush is behind me ... and she's about ready to whack me across the head if I try to be something I'm not," he said at a town hall in Lebanon, New Hampshire. Bush also knew when to invoke his mother to connect with his audience. Months earlier at a GOP primary debate, Bush revealed on stage that he smoked marijuana as a young man. "I'm sure that other people might have done it and may not want to say it in front of 25 million people," he said. "My mom's not happy that I just did." As his comments went viral, he tweeted later that night: "Sorry Mom." Voters also got a kick out of hearing Bush describe his mom as the irreverent enforcer. Asked once in Nashua about the kind of advice he gets from his family, Bush joked that he shouldn't reveal the blunt guidance he gets from his mom. "I can't tell you what my mom's advice has been because it is R-rated. ... I'm just joking," he said to laughs, before pausing. "No, I'm not." Indeed, Barbara Bush was unafraid at times to speak her mind about Trump, a man who ridiculed her son as someone who's "dumb as a rock" and "low energy." In an interview with CNN's Jamie Gangel, Barbara Bush said she was "sick of him" and didn't want to "think about him." Weeks earlier, she had starred in an ad for her son, and Trump fired off a tweet targeting the former first lady. "Just watched Jeb's ad where he desperately needed mommy to help him," Trump wrote. "Jeb --- mom can't help you with ISIS, the Chinese or with Putin." Hitting back, Jeb Bush's campaign tweeted a photo of his mom in football gear with the caption, "I'd be careful Donald." Jeb Bush also responded personally, describing Trump as "idiotic" on foreign policy and argued the US doesn't negotiate with ISIS. Then, he brought up his mom again. "If my mom did negotiate with ISIS, it would be a pretty tough negotiation," he told reporters. "Far better than anything he could do." At the first event Barbara Bush attended for Jeb, her son ditched his normal walk-out song to play the Beach Boys' "Barbara Ann." She was received like a rock star at the Derry, New Hampshire, event, which was marked by a larger-than-normal audience and buzzed with rally-like energy. "Just wonderful to be here," she said with her gentle but ever authoritative voice. "To be with the world's nicest man." The audience continued to stand on their feet and a hoard of cameras and reporters looked on as the former first lady ticked off a list of motherly adorations. "But he's not a bragger -- we don't allow that -- but he's decent and honest," she said. "He's everything we need in a president." The cameo came after Bush's dismal sixth place finish in the Iowa caucus and before the New Hampshire primary, in which he would place a disappointing fourth. The move to bring out his mom was a Hail Mary of a strategy that ultimately proved unsuccessful. Bush dropped out of the race on February 20, 2016, after coming in fourth place in the South Carolina primary. One day before, Barbara Bush — dressed in a red sweater and pearls -- was sitting behind her son at an event in Spartanburg, South Carolina. Jeb Bush spoke movingly about having her on the trail. "To be the child of Barbara Bush," he said, pausing as he put his hand on his heart, "Wow, I'm a lucky guy."